Assassin’s Creed Origins added a whole new weapon and inventory system to the series. Enemies would drop weapons that had different levels of rarity, which you could swap out and upgrade as you progressed through the campaign. While you could change your outfit and upgrade your armour stats, you didn’t have the same level of granularity as with weapons. Ubisoft has changed all that in Assassin’s Creed Odyssey, now you’ll be able to wap out individual pieces armour – letting you have full control over not only what stats you want to focus on but also how you want your hero to look. There are no sandals in our pick of the best sandbox games, but there are certainly open worlds and plenty of assassination possibilities. 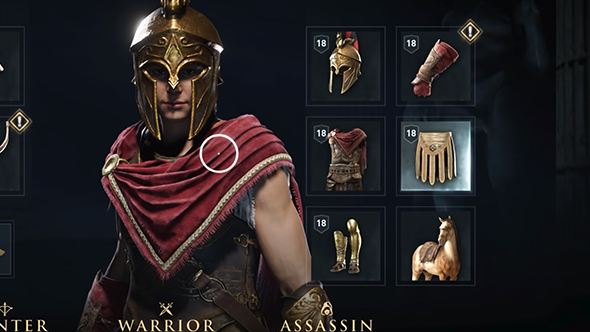 You will be able to switch out your hero’s helmet, chest armour, bracers, and pteruges – the decorative leather skirt worn by Greek and Roman soldiers. Customising a character for the stat build aside, I’m excited to have full control over the look of my hero. I like having a prepared outfit but I also love to construct a great looking item set myself. We don’t have long to wait until Assassin’s Creed Odyssey’s release date so we can start daydreaming about the builds we’ll be able to assemble. And, while getting kitted out in some great looking threads is a definitely incentive, this new system also means you can build an armour set that also complements the skills you choose to specialise in. For instance, buffing your health and armour to tank in combat – maybe if you favour the slower heavier weapons – or a high damage set that lends itself to a more aggressive approach.